LOS ANGELES - Dec. 18, 2018 - PRLog -- The United Premier Soccer League (UPSL) is pleased to announce the Goldsboro Strike Eagles FC as a member starting with the 2019 Spring Season. Based in Goldsboro, NC, Goldsboro Strike Eagles FC will begin UPSL play in the Southeast Conference Mid-Atlantic South Division and play its UPSL home games this season at the Bryan Multi-Sports Complex (501 S. Oak Forest Road, Goldsboro, NC 27534) in compliance with the UPSL's Minimum Standards. United Premier Soccer League Southeast Conference Manager Andy Salandy said, "Goldsboro Strike Eagles FC is a great addition as we continue to add teams throughout the Southeast. 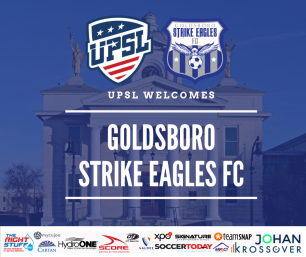 Goldsboro Strike Eagles FC sees the value in the UPSL as a league, and will bring quality young players from Goldsboro, N.C. and Wayne County, to the Southeast Conference. We're excited to add more quality organizations from North Carolina, and cities east of Raleigh are growing as soccer across the state continues to be huge. Bringing a team into the league from Goldsboro will connect the other teams from Raleigh to Greenville to South Carolina, so this is good for the league and we're excited about the Goldsboro Strike Eagles FC." Mr. Yacouba Ide Niandou is Head Coach of Goldsboro Strike Eagles FC and is assisted by Coach Hosvan Giron and Coach Jesus Pantoja. Coach Yacouba is a native of Niger, West Africa, and a product of the National Soccer Talent Academy in Burkina Faso, West Africa. Yacouba played for the National Team until age 17 and moved to the United States in 2004. He has pursued his passion for soccer via coaching and has received several recognitions, including high school coach of the year and Inter Community coach of the year. Coach Hosvan, a native of Honduras, and Coach Pantoja, a native of Mexico, are soccer fanatics that will be contributing their soccer coaching skills to the Strike Eagles coaching staff. Goldsboro Strike Eagles FC Head Coach Niandou said, "We have a lot of talented players looking for a place to play after high school. These players don't always go to college and, if they do, then they need a place to play during the offseason. We have a lot of players that are looking for more exposure and want a place to showcase their talent. Our vision is to offer a platform for the players to continue building their soccer knowledge and to learn to work hard in a pro development organization so they can ultimately get the opportunity to play at the professional level." Goldsboro Strike Eagles FC has hosted tryouts and begun its weekly training sessions, and will announce its upcoming spring season game schedule in early 2019. Goldsboro Strike Eagles FC is an American Soccer club currently based in Goldsboro, NC and a new member of the United Premier Soccer League. Goldsboro Strike Eagles FC will begin play in the UPSL Southeast Conference. Founded in 2018, Goldsboro Strike Eagles FC can participate in the qualifying rounds for the Lamar Hunt U.S. Open Cup through their affiliation and membership with the UPSL, the U.S. Soccer Federation (USSF) and the United States Adult Soccer Association (USASA).